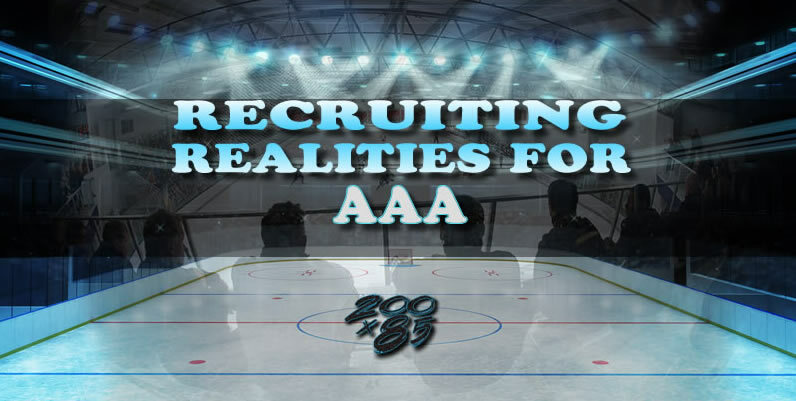 Over the years we have seen our share of interesting recruiting tactics from AAA coaches. Most will say they coach to help impact the lives of these young athletes but their recruiting habits do not match that message with their actions. Each AAA coach must consider these issues below when recruiting a player- if they do not… it will come at a cost. There’s not a player out there who is good enough to compromise your integrity. Do not sell your soul in the name of winning, because once you do that you assure yourself of losing. Don’t be part of the problem by promising the world to kids and parents and putting yourself in a compromising position in the eyes of the majority of your players and parents. Some of these coaches are promising PP, PK, top line spots etc….in our opinion, that’s very disingenuous and not fair to all the kids who are on your team already and it’s really unfair to the guys/girls that you are recruiting. Our advice is to tell these players you will give them an opportunity to compete. That’s it. When you’re recruiting these kids it becomes easy to lower your standards. Fight that impulse, stay true to yourself. Great coaches understand it takes a true team, not just a collection of the best talent to win. Winning is a part of AAA, but development is the priority. Do not take a player who doesn’t deserve to be on your team, so you can get another player who does, or for any financial benefit. This is also a disaster waiting to happen. A coach who does that immediately has his credibility with his other players and parents compromised. They all know the score. When you were an athlete, would you like to know you made a team because the coach wanted your best friend or because your parents would kick in extra $? More to the point, understand that you are not doing a kid who shouldn’t be on your team a favor by putting them in a position he or she is sure to fail. Do the right thing and avoid any package deals! It is our experience that the people who do the most crying poor are the ones who least appreciate any financial aid. Each year, they have their hand out and consider financial aid there right because of their child’s ability. No one should get financial aid who is not in legitimate financial need! If you feel the need to compete with that, you are jeopardizing the players NCAA eligibility. When someone tells you they are being offered a ride, ask them if they know the NCAA consequences of that. Ask them how their financials are being vetted to determine that aid. Again, do the right thing. Recruit hard, fight hard, fight fair, stay above the crap. Negative recruiting tells the prospective parent all they need to know… about you! Sell your program for its development model, for the great coaches, for the support every player and parent gets. Make a point of not talking negatively about a rival program or coach. “I’m sure _______has a nice program, but here’s what we offer your player_____.” You will win far more recruiting battles taking the high ground with your fellow competitors and being straight up with your players & families. The higher you raise the bar, the more successful you will be.